The Results are in: after a month-long battle that began with an appearance slinging Anxiety Burgers at our Launch Party in August, last year’s runner-up Slow Boat Brewery outpolled The Local to earn the title of champion of the 2015 Burger Cup. “Putting fries in the burger is just pure genius,” said one voter, a sentiment echoed by more than a few Slow Boat partisans. This year’s runner-up, The Local, received abundant praise in the final round as well, particularly for the generous heaping of avocado served on their signature Dry Rub Avocado Burger. “The avocado for a Californian really gives the burger the down home feel for me,” remarked one voter. "I tried [the Dry Rub Avocado Burger] for the first time on Sunday! It was amazing, the meat was juicy, not dry, plus the slight pepper burn from the spices and the smooth and cooling avocado,” gushed another voter. “Even [if]they don’t win, they have a winner on their hands. I will go back with friends." In the other race of the match, three-time champion Home Plate BBQ outpolled Great Leap Brewing to claim a solid third place in the overall poll. 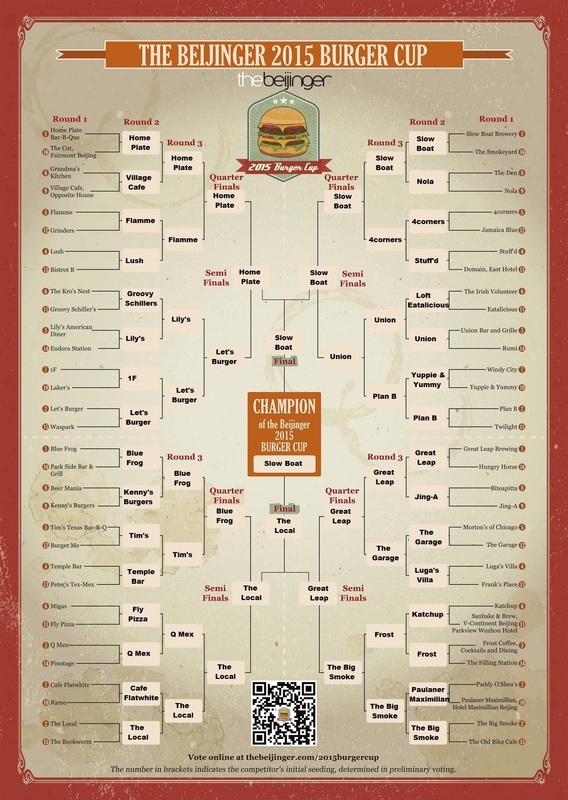 With that, the Burger Cup comes to a close for another year, and we have our final rankings of the city’s Best Burgers from 1 to 64, as determined by you. It was a big year for change in the annual rankings, with 25 percent of the competitors making their Burger Cup debut this year. Top ranked among the first-timers was Jing-A and their trio of sliders at No. 16. Three other first-timers also cracked the Top 25: Loft Eatalicious (#21) Kenny’s Burgers (#22) and Groovy Schiller’s (#24). Other venues found their fortunes surging in this year’s contest. Shunyi’s The Garage, which placed No. 46 last year, rocketed 31 places to No. 15. The second largest jump was by Cafe Flatwhite, one of the many vendors to feed the hungry masses at the Launch Party, which leaped 23 positions from last year’s No. 49 to land at No. 26. Others that saw their burger fortunes rise this year included the Opposite House’s Village Cafe, The Filling Station, Pinotage, and The Bookworm. Others fell in the annual rankings. Among those that slipped the largest number of slots were Rumi, Paddy O’Shea’s, Beer Mania, and Windy City. Two venues closed during the competition: Flamme and Twilight, and others either closed down over the past year or fell out of the top 64, including Burger Bar, Chef Too, Main Street, The Box, Burgers & Beer, Alibi, and the Iron Horse Saloon. Two other prominent spots stopped selling burgers: Migas and Kro’s Nest. So there it is – the 2015 Burger Cup in a nutshell. Click here to see the final rankings, including a look at the Top 12 and how they ranked compared to last year. Don’t forget to narrow the gaps in your own burger knowledge by trying the ones you have yet to sample – you can’t go wrong with any of them! This post first appeared in thebeijinger.com on September 16, 2015 and has been slightly modified.